In the middle of our walk of life, I found myself within a forest dark, for the straightforward pathway had been lost. It seemed to him that he had stepped through a high window that looked on a vanished world. A light was upon it for which his language had no name. All that he saw was shapely, but the shapes seemed at once clear cut, as if they had been first conceived and drawn at the uncovering of his eyes, and ancient as if they had endured for ever. He saw no colour but those he knew, gold and white and blue and green, but they were fresh and poignant, as if he had at that moment first perceived them and made for them names new and wonderful. In winter here no heart could mourn for summer or for spring. No blemish or sickness or deformity could be seen in anything that grew upon the earth. On the land of Lórien, there was no stain. The forest is one of these great symbols which have been ever-present in myth, legend, literature, film and others, if not all, creative endeavours of mankind. 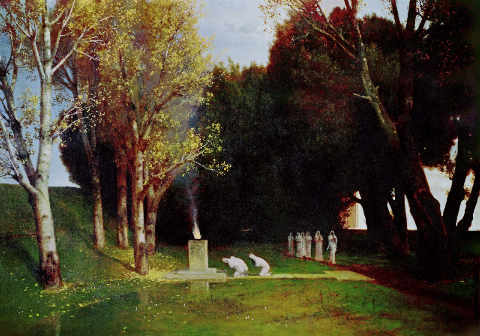 I have long been enchanted by the following poem by Baudeleaire called Correspondences, mainly because of the way it is both deeply spiritual and sensual (note the wonderful use of synesthesia) and how it touches upon the mystery of forest symbolism without defiling its depth and mysteriousness. Correspondences is a term put forward by Swedenborg to denote the affinity between Above and Below, a hidden network of secret relationships, the belief in which is at the heart of symbolist thought. According to Swedenborg, correspondences exist between Spiritual and Natural Plane of the Mind, between God and the world he created, between body and spirit, and between action and intention. The poem shows wonderfully what the forest may correspond with in the spiritual realm of symbols. Which look at him with understanding eyes. Perfumes, sounds, and colors correspond. That sing the ecstasy of the soul and senses. The forest is the place where vegetable life thrives and luxuriates, free from any control or cultivation. And since its foliage obscures the light of the sun, it is therefore regarded as opposed to the sun’s power and as a symbol of the earth. In Druid mythology, the forest was given to the sun in marriage. Since the female principle is identified with the unconscious in Man, it follows that the forest is also a symbol of the unconscious. It is for this reason that Jung maintains that the sylvan terrors that figure so prominently in children’s tales symbolize the perilous aspects of the unconscious, that is, its tendency to devour or obscure the reason. Zimmer stresses that, in contrast with the city, the house and cultivated land, which are all safe areas, the forest harbours all kinds of dangers and demons, enemies and diseases. This is why forests were among the first places in nature to be dedicated to the cult of the gods, and why propitiatory offerings were suspended from trees (the tree being, in this case, the equivalent of a sacrificial stake). I think Cirlot succeeds in capturing the gist of forest symbolism but I would dare to expand a little on his definition by looking at the forest imagery in Tolkien’s Lord of the Rings (the book). In the first part, the heroic quest begins in the Old Forest, which borders the Shire symbolizing the threshold on the verge of the unknown. Marching through it, the hobbits go deeper and deeper and always keep turning left, which symbolically implies introversion and probing the unconscious. The trees are perilous, alive and can be malicious. At one point Merry and Pippin get trapped in the trunk of Old Man Willow, who had cast a spell on them making them sleepy. In this part of the hero’s journey the forest symbolizes the threatening aspect of the personal unconscious, its deathly pull towards inertia stemming from the lack of consciousness and self-knowledge. 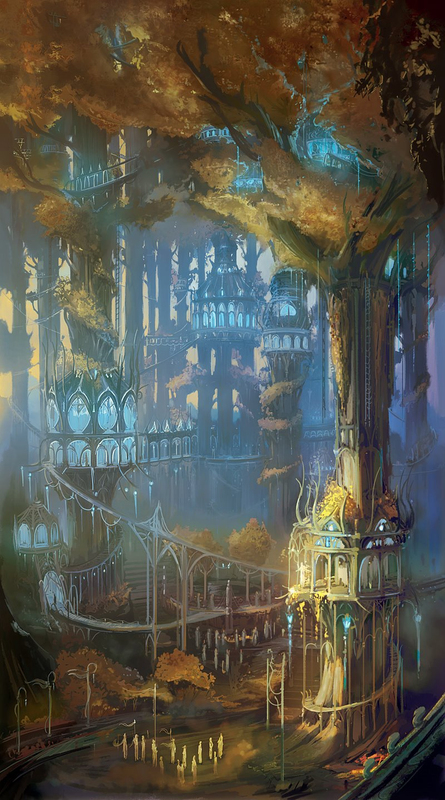 The next stop in the journey, which is the beautiful forest of Lothlórien, where Lady Galadriel resides with the Elves, symbolizes the enchanting, magic and creative powers of the collective unconscious. This is a sacred grove not touched by Sauron’s evil powers. The word Lórien meant literally Land of Gold and Dream. It is a place where the heroes can find a respite in their quest, get in touch with their own inner beauty and divinity and fill their hearts with hope, meaning and vision of the future, tapping into the prophetic powers of Lady Galadriel. Lastly, the heroes find themselves in the Fangorn Forest, where the Ents (tree-like creatures, shepherds of the trees) dwell. The Hobbits have gone full circle now in their journey of self-discovery and are able to ensure the assistance of the Ents. In other words, they are now able to form a meaningful connection with their own unconscious Self and find help and inspiration there. In the ultimate Gaia’s revenge against her oppressors, who have been chopping down the forest, the Ents invade the evil Saruman’s domain and destroy it. The Fangorn Forest symbolizes simultaneously the destructive forces of the collective unconscious but also its Saviour aspect. The Hobbits have now learned that “where danger is, grows the saving power also”, as the German poet Holderlin put it.An act of destruction can lead to magnificent creation, which once again shows that the power of archetypes activates light and dark forces at the same time. This entry was posted in The Forest and tagged archetypes, Baudelaire, C.G. Jung, depth psychology, forest, literature, Lord of the Rings, mysticism, poetry, spirituality, Swedenborg, symbolism, symbols, the law of correspondence. Bookmark the permalink. Beautiful post! I’ve always felt that forests are enchanting places full of spirits and so alive with energy, an energy so different from that of cities. Thank you. A forest is my favourite kind of place and I can never wait to escape the city and get there. I am blessed to live near a large forest, hence the inspiration. This was a perfect post to read before going to sleep. Your own writing too “is both deeply spiritual and sensual”, the text fascinating beyond words. It also brought my own memories to the surface. For instance, we used to take hours to come from school via a forest with my friends using all our imagination to transform ourselves into characters from another world and making up great stories. In that sense I´m a typical Scorpio that I have turned up in, relative sense, every stone to look at what´s beneath. 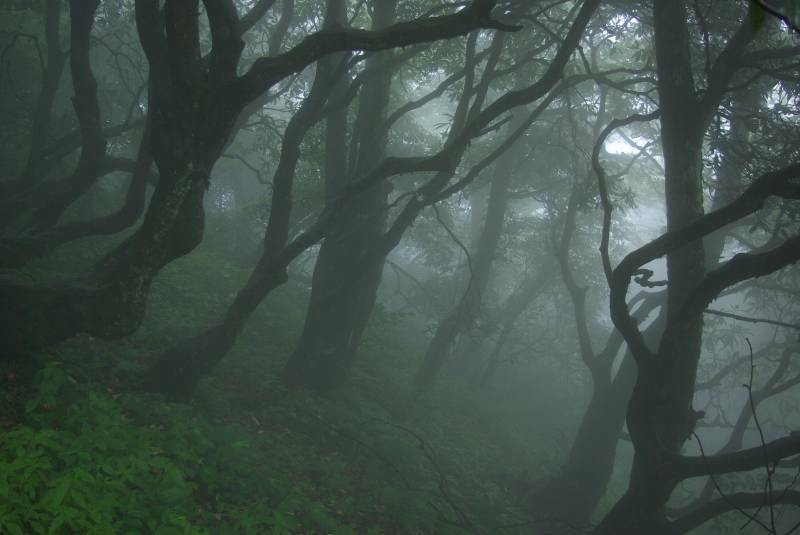 I haven´t been afraid of the forest (but of other things), still it is a mysterious and fascinating place to me. Not to mention that today I happened to find great poems for children and for inner children including poems about trees. So, I was subtly connected to the forest theme, too. What I would like to do right now is to frame this comment and hang it over my bed. Thank you. If you can weave together Dante, Baudelaire, Lothlorien, and synesthesia with the symbology of forests, you should feel good about your synthesizing abilities. I had not thought of forests in the lord of the rings in the way you analyzed it- illuminating. The new name for my blog should be: a synthetic synesthesia of symbols. I’ve always been an ocean and desert person, but where I live now there are enormous tracts of pine woods between us and the ocean. With no desert to speak of, the woods seem to have “stepped in” to fill that earthy/grounded place for me. I come bearing music again — very, very appropriate, courtesy of my second-favorite band ever. The singer/lyricist died in 2010, and I mourn the loss still. They’ve been doing shows recently with his son, also a musician, filling in. This music is magnificent, yet again. They were an incredible band. I always liked his voice, but it’s his songwriting I mourn the loss of most of all. If you can track down a song called “I Don’t Wanna” (It should be on YouTube. ), it has to be the most powerful love song I’ve ever heard. you are a philosopher and more – the depth is mind blowing – the intellect kind of incalculable – the forest is indeed the place where the mind grows beyond itself – all of India’s greatest thoughts and its thinkers emerged from forests – the Upanishads were all conceived not in the Himalayas where sages meditated on the truth, but in forests. You are too kind. Thank you very much. The information about the Upanishads is fascinating. Very tantalizing and also entertaining again as usual. You deserve a bigger public! Personaly i find it interesting that as an anology of the forests you write about some darker sides of the collective subconsciousness. I was just wondering making a haiku about some darker emotions of myselve a few days ago, how much attention this shadowsides of our innerworld has on your blog. In fact I had the imoression that this was a bit underexposed 🙂 (maybe Im completely wrong, I didnt read most of your posts). Or is the collective subconsciouness only as bright as the sufi teacher of your youtube movie tells us? I believe in the power of the Shadow and I think I wrote about it here and there. Just off the top of my head, take a look at a very old post of mine The Scorpion on Bond’s Hand. There is no light without darkness. Really glad you liked it! So rich. Had to Facebook it! I definitely enjoy reading your posts Monika. You have a wonderful breadth of knowledge from which you weave wonderful writings. Thank you so much, Henry. You know, I had no idea how much fun writing is before I started this blog. A fascinating post. You have woven these pieces together well to substantiate your thoughts, adding a touch of the mystic to your analysis. Thank you! I do love your blog. you do have an interesting blog and honestly dont know from where to start.. so many great topics to choose from.i have an affection for Jungian psychology( i also studied psychology) AND mythology AND i loved your writings so far,(esp. the way you present them) so i guess i m happy to have found your blog.will be visiting again soon.cheers! As a relatively new blogger, there are some technical (and content) flaws but your haunting piece is wonderful! Thank you for your kind words. I appreciate them. A beautiful post! thank you for sharing!